LEE, Richard Henry, (brother of Arthur Lee and Francis Lightfoot Lee, and great-grandfather of Blair Lee), a Delegate and a Senator from Virginia; born at Stratford, in Westmoreland County, Va., January 20, 1732; after a course of private instruction attended Wakefield Academy, England; returned in 1751; justice of the peace for Westmoreland County 1757; member, house of burgesses 1758-1775; Member of the Continental Congress 1774-1779; sponsor of the independence resolution; a signer of the Declaration of Independence; author of the first national Thanksgiving Day proclamation issued by Congress at York, Pa., October 31, 1777; member, State house of delegates 1777, 1780, 1785; served as colonel of the Westmoreland Militia; again a Member of the Continental Congress 1784-1785 and 1787 and served as President of the Congress in 1784; member of the Virginia convention which ratified the Federal Constitution in 1788; elected to the United States Senate and served from March 4, 1789, until his resignation October 8, 1792; served as President pro tempore during the Second Congress; retired from public life; died at his home, Chantilly, Westmoreland County, Va., June 19, 1794; interment in the old family burying ground at "Mount Pleasant," near Hague, Westmoreland County, Va. Dictionary of American Biography; Lee, Richard Henry. The Letters of Richard Henry Lee. Edited by James Ballagh. 1911-1914. Reprint. New York: Da Capo Press, 1970; Chitwood, Oliver. 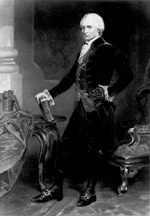 Richard Henry Lee, Statesman of the Revolution. Morgantown: University Library, 1967.